BEACH 600 FEET; RESORT GOLF COURSES 1 MILE AWAY. PET-FRIENDLY; DON'T FORGET TO BRING FIDO ALONG!!! WE NOW ACCEPT PAYMENT FOR ALL RENTALS BY CREDIT CARDS. Comfortable home with open floor-plan; conveniently located on the first beach-side street just inside the Sea Pines Plantation Ocean Gate; only 1 mile from the Plantation Club and both the Sea Marsh and Blue Heron Golf Courses; and only about 600 feet from the beach. World-famous Harbortown Links, numerous restaurants & shops are less than 3 miles away. For nature lovers and hikers, the beautiful Forest Preserve is only a short 10 minute walk away. This spacious, non-smoking home sleeps to 13 people, and features a huge two-story great room with wet bar and fireplace, dining area, and screened-in porch overlooking deck, private pool and adjoining wooded area. Beautifully decorated with luxurious appointments throughout. The home features four bedrooms plus a sleeping loft. The huge master bedroom appointments include a king-size bed, fireplace, Shower, Futon, TV/VCR and California closets. The second bedroom (2nd floor) includes a queen-size bed, TV and full bath. The bedroom on the first floor features two twin beds and TV, with a full bath just outside the door. Sleeping loft (in second floor hallway seating area) has a fireplace, TV and two over-sized arm chairs, each that open into twin beds. Fourth bedroom (on third level) has three twin beds with TV; a great area for kids to 'get away from it all'. Completely new kitchen features new cabinets, GE PROFILE refrigerator, GE PROFILE double oven, cook-top, microwave oven, granite counter tops and glass tile backsplash. Linens, dishes, small appliances and all utensils are included. The house is 'DOG FRIENDLY' but prospective renters MUST request Owner approval in advance. All pets MUST be fully house-broken and healthy. When the renter intends to bring their dog along, a Pet Security Deposit is required; payable by separate check. IF no pet-related damage is found to exist upon inspection following check-out, the Pet Security Deposit check is typically destroyed without having been deposited, If the Renter wants the check returned, that request will be honored. If pet-related is discovered the Pet Security Deposit will be used for necessary repairs, with any unused portion returned to the Renter. If pet-related damage exceeds the Pet Security Deposit, the Renter must agree to cover any such excess repair costs. Relax, you're on vacation; but if needed, complete laundry facilities are available. Keywords: 4 Bedroom, 3.5 Bath House w/Pool; Beach 600 Ft; Golf 1 Mile House, WIFI, Sleeps up to 13 people. 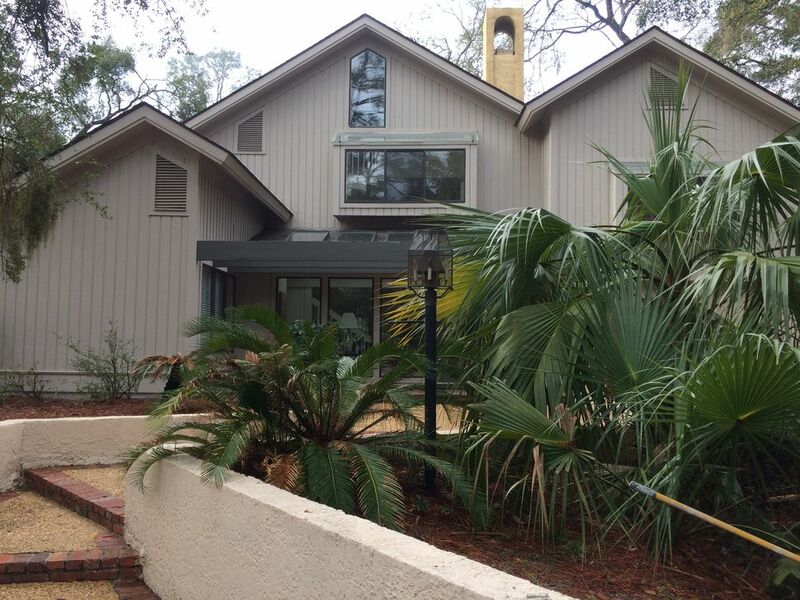 We purchased this home because of its open floor-plan, comfortable amenities and very close proximity to the beach, all while being nestled in a wooded setting among the beautiful Palmetto trees. Add to that the restaurants and numerous activities available within Sea Pines Plantation, including Harbortown, and you've got all you need for an enjoyable, fun-filled getaway with family and friends. House is located a short 5 minute walk from the sandy beach but there is no direct ocean view. One in the kitchen; one other phone in the master bedroom; FREE CALLS ALLOWED IN THE CONTINENTAL U.S. ONLY. 1 system for first floor only. 2nd system for 2nd and 3rd floors. Bed linens, towels and blankets, etc. Room for 2 cars in front of the house, 2 cars in the carport and 2 cars in the driveway. Bath towels, etc. NOT FOR BEACH USE PLEASE. Dining seating for up to 10 persons in the house, excluding the granite island, bar area and outdoor seating that seats an additional 15 persons. There are books, magazines and some kids games in the GREAT ROOM book cases. There are some games in the book case adjacent to the Great Room TV. Call RIDING TIGERS and mention the OWNER10 discount and the address; 6 CANVASBACK in Sea Pines to get a 10% discount and delivery. Two (2) Resort courses are located 1 mile from the house. Harbortown Links is only 2-1/2 miles away. 2 Fireplaces, Central Air Conditioning, Cable TV in Great Room & All Bedrooms, DVD player in Great Room, Dishes & Cooking Utensils provided, Clothes Washer & Dryer, Shower in Master Bedroom, Private Swimming Pool, Folding Beach chairs. Kitchen was completely updated in March 2014. Second floor updates were completed 12/17, featuring new flooring and carpet, new bathroom vanities with Cararra marble countertops, new faucets and new mirrors. Master bedroom updated with new carpet, etc. and a new futon was added. My friends and I spent the month of March, 2019 at # 6 Canvasback Rd in Seapines, HHI. The house is spacious and very comfortable. There is plenty of room for guests to gather or read quietly. We have been spending the month of March in HHI for the past 10 years and this house was by far the best yet! I like to cook so the kitchen is an important part of out stay. The kitchen is large, well equipped and newly renovated. Bedrooms, baths and living area are updated and accommodating. AND there is a garage! The location is a short walk to a private beach and we were able to be out there everyday. This was a great place to stay and we are planning to be there next year! Just inside Sea Pines. Close to beach. Great kitchen, especially since we stay for 2 months in winter. Love open floor plan. My only negatives are that laundry is outside home itself, and master bed is hard with too small linens. Thanks for your review. We take the comfort of our guests very seriously and we have always sought to look after their concerns. I sincerely wish you had immediately informed me that you thought the mattress in the master bedroom was too firm because, given your two month stay, we would have been pleased to provide a softer mattress topper for your use. As it was, only learning about this from you following your departure gave us no opportunity while you were staying at the house to resolve that for you. For what it is worth, before we replaced some bedding about 2 years ago we surveyed guests about their mattress preferences. Most replied that they preferred firm mattresses. That said, I of course recognize that this is a personal preference and a firm mattress may not be for everyone. Regarding the laundry area, you are correct that it is located in a room off the carport; but in fairness to readers who may not know the house, that literally means that the door leading to the laundry is 2 steps down and about 6 feet from the great room door on the first floor of the house. Regardless of the above, it was our understanding that you enjoyed your stay. We hope to have the opportunity to host you again on a future trip to the island. The house is spacious and nice. All amenities needed for a quick and enjoyable trip to the island. Thank you Ralph. We are pleased you had an enjoyable stay with your family and hope to have the opportunity to host your group again in a future trip to the island. The house was beautiful. Can't say enough positive things about the accommodations. Thank you. We try hard to provide a warm, inviting property that will provide a carefree, comfortable experience for all of our guests. We sincerely hope you will consider our house again on a future visit to Hilton Head. Making Beautiful Family Memories at HH! Just returned from 4 beautiful days at HH to celebrate my Dads 80th birthday and parents 62nd anniversary with my immediate family! The house is very comfortable and extremely accommodating from wide open spacious kitchen and family room to large private shaded deck with plenty of seating. Easy access to the beach path for a short stroll to the ocean was another bonus! This Sea Pines Plantation home is definitely the place to go to enjoy a very tranquil Beach vacation. Absolutely loved the biking through Sea Pines as well as on the beach! The property is so relaxing, we only left the plantation one time! I can sense the owner is a class act as well and right on top of all questions/emails and provided very useful details that really made this a great trip from start to finish! Thank you again Steve! I will definitely reach out to you in the future to make more family memories! Thank you for you nice review. We try hard to see to it that all of our guests have an enjoyable, carefree experience and we are very pleased that you and your family had a good time. We would love the opportunity to host you again on your next visit to Hilton Head Island. My family stayed October 6-11, 2018. The house was just as advertised and gave us plenty of room. The kitchen was well equipped for cooking and we really enjoyed the gas grill on the patio. The beach is a very short walk from the house for morning walks. We traveled with two teenage daughters and everyone really had a nice time. The owner, Steve was great to deal with! DISCOUNTED BIKE RENTALS - Through an arrangement we've made with Riding Tigers Bike Rentals you can enjoy discounted rates on weekly bike rentals. To take advantage of this discount, simply call (843) 686-5833 or (888-371-7115 toll free) and let them know you are renting our property at #6 Canvasback in Sea Pines Plantation; they we will know to give you the reduced rates. Between Memorial Day and Labor Day reservations should be made at least 2 weeks in advance as they often run out of bikes. House is available only on a first-come, first served basis. Renters must confirm that they are no less than twenty-five (25) years of age and are financially responsible for any damage done above normal wear and tear. Cleaning fees and all applicable fees relative to the house rental EXCEPT VRBO WEBSITE FEES are included in the rental rates quoted. The Property Owner does not receive any portion of VRBO website fees charged to renters. It is also our understanding that the VRBO fee is refundable by VRBO if, for any reason, you do not actually proceed with the rental. Sea Pines automobile gate pass fees are not included in the rental fee quoted for the house and must be added to the rental fee at $16 per week per pass; rates are subject to change by Sea Pines Plantation without prior notice. Gate pass fees are payable whenever the final payment for the Property rental is made by the Renter. RENTAL RATES MAY CHANGE WITHOUT NOTICE Dogs considered on a case-by-case basis; requires a separate PET SECURITY DEPOSIT and a provision added to the RENTAL AGREEMENT stating that the Property Owner assumes no risk or liability for dogs brought to the house by the Renter or Renter's guests. Renter assumes full responsibility for any pet-related damage to property and full liability for any pet brought to the premises. Renter also is responsible for adhering to all local ordinances regarding pets.